I really should stay out of craft stores. There are so many wonderful things to see and to touch. It is almost impossible for me to go into one and not buy something. I bet the employees can tell because of the glazed look in my eyes. 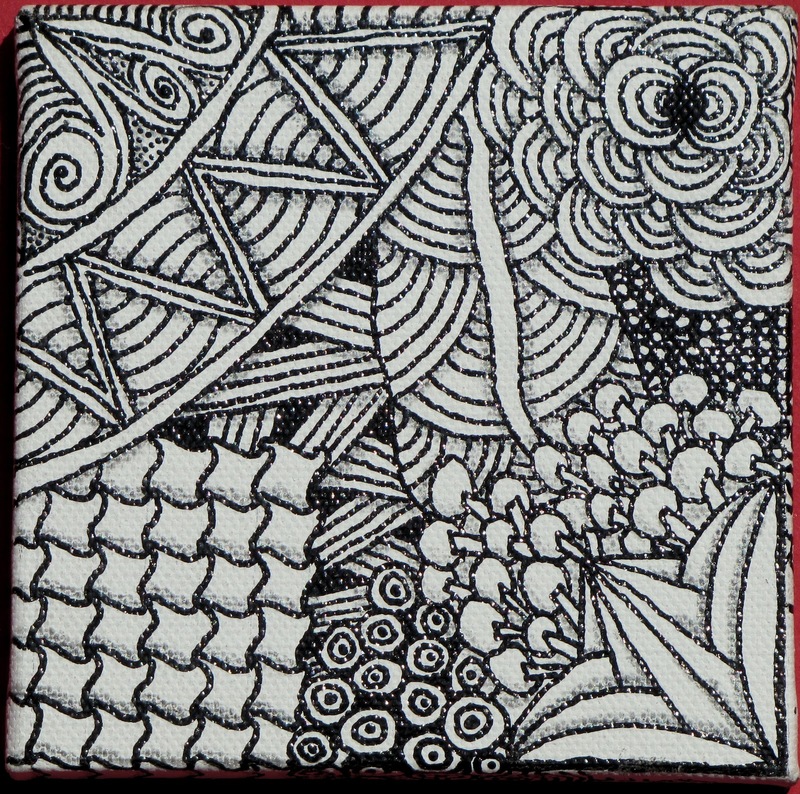 It is this habit of wandering around that I found these little 4" canvas. You can see all of the mini canvas that Michaels has here. 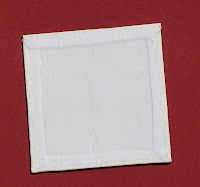 I have limited myself to using the mini canvas and what they call the canvas panels. Both come in white and black. The difference in the mini canvas and the panels are how they are constructed. As far as I have been able to tell, the canvas on both are the same. 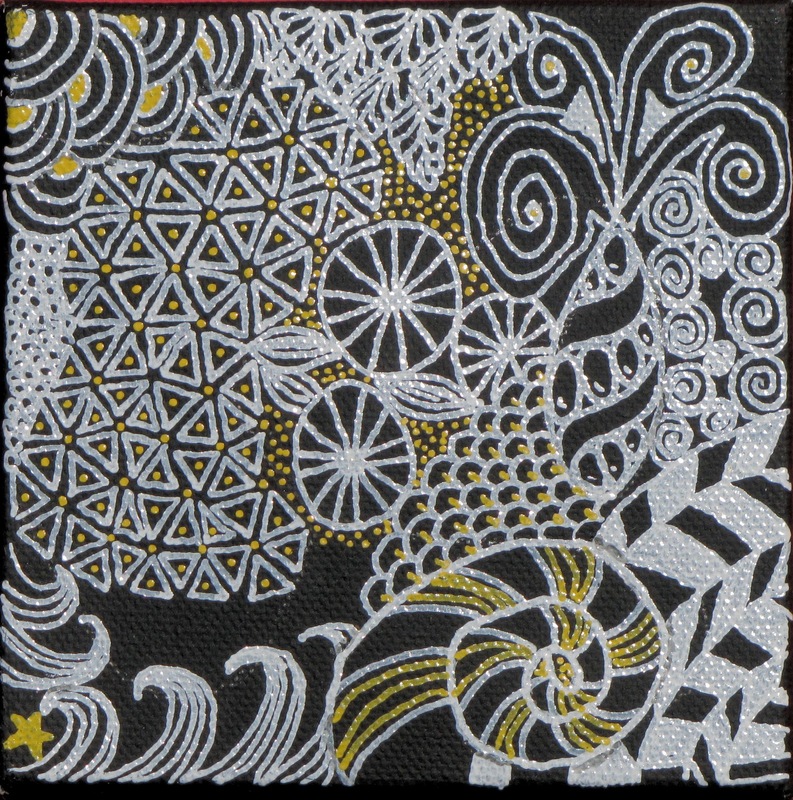 The mini canvas is thicker and requires a lighter touch. As you can see in the photo I took of the back of the mini canvas, there is a nice wooden frame for support at the edges, but the center is open so pressing hard with your pen is probably not a good idea. I like how the canvas is wrapped around the sides though. It makes a good place to hold into while working. I also like to continue my lines down the edges. By continuing a pattern, it just gives the design more room. You can also make a whole new pattern there for added interest. A word of warning though, you may wish to add lines to the edges last. I have not and ended up with paint on my fingers and/or smearing what I have just made. The mini panels are just as easy to work with as the mini canvas and as I said before, seem to be exactly the same on the front. The back however is quite different. As you can see to the right, it is solid. So, anyone with a heavy hand can press down to their hearts delight. These are a lot thinner however, so there is no edge to add to the design. 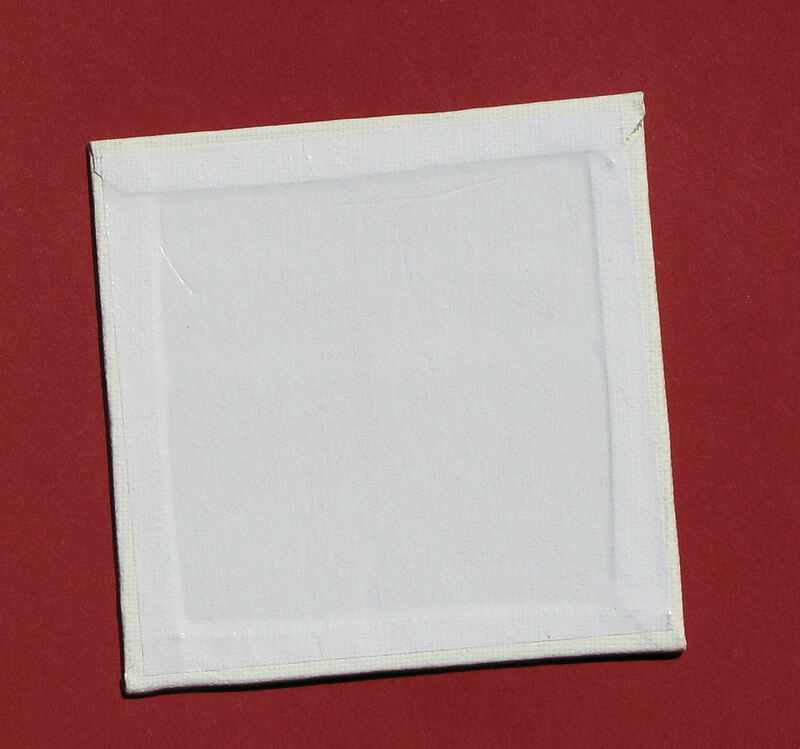 These also come 4 to a package where there are just 2 in the canvas. Both the black and the white are primed with titanium acrylic gesso and have a medium texture surface. This texture may not be for everyone. It is very different from the texture on the paper that I usually use. I have not tried painting the surfaces before drawing on them. It may be that a layer of white/black paint would smooth the surface out. Now, pens. 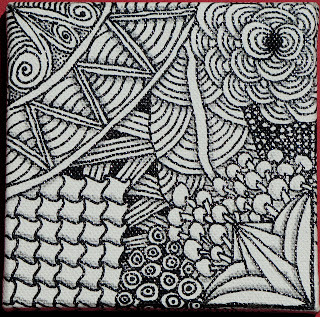 I have not tried using my micron pens on these tiles. I did read up a bit before starting and from comments that I have seen, the gesso surface is a micron killer. Over the winter I bought some Uchida Decocolor Extra Fine Paint Markers to use on ornaments. These are not as fine a point as the micron 01 but probably are in the size of the micron 08 tip. I like how these pens flow on the canvas a lot. The ink has a steady flow and fills in the texture nicely (meaning that there are no skips in the line.). One draw back, this is paint and not ink. Be aware of where you rest your hand or touch with your fingers. For some of you this may be a no brainer, but I have smeared a bit and forever have bits of design on my fingertips. :) The paint has a gloss to it when dry and once totally dry they do not smear or come off when touched. I tried shading with pencil but I was not happy with the way the pencil went on the canvas. I used blending stumps and they helped, but on the mini canvas, you just can't push hard enough to get a good blend. 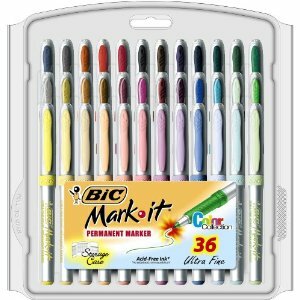 After posting on Facebook about my attempts, Sharon Payne suggested that I use a Bic Mark-It pen for the shading. Sharon's Facebook page is here. You should check out her stuff. She does incredible work. After Sharon's suggestion I headed over to Staples to see if by chance they had just a gray pen. To my great luck they did and I bought two to try out. 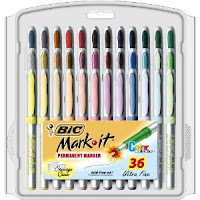 The Mark-It pens come in ultra fine and a varity of colors. I bought a small set a while ago but had not really used them as they bleed when used on paper. Well guess what? They don't bleed on these canvas tiles. I tried these on my next tile. The smaller tip is nice for detail patterns. They are still bigger and the 01 size of the micron. I can't say exactly where these measure, maybe at the 05 size. The ink is flat with these markers so more like when tangling on paper. What I am not find of about these pens is that they "puddle" at the tip as you draw. This isn't a problem while you are actively drawing but when you stop, if you aren't careful, you can get a spot of extra color where you don't plan. I usually try to "push" the puddle into a back line where it gets lost or stop my lines at a place where I will go back and add shade later. A bit of darker color there doesn't seem to matter as much to me. This is my first mini canvas. I used white and yellow paint markers. After I got the grey Mark-It, I went in and added a tiny bit of shading just to see how it would work. 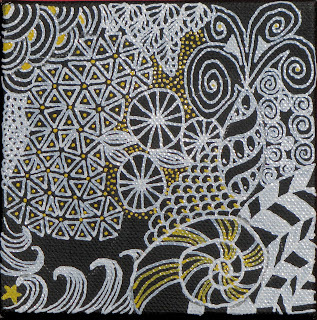 This is a mini canvas done with the black paint marker and pencil shading. I like the darkness of the pencil but I don't like how it shades the top of the canvas and not the lover part of the texture. I'm also learning that with the paint markers, an open pattern is better. Patterns with too much detail can run together a bit. Of course you can probably off set that by making the pattern larger. I am working on a few more. I want to see if I can solve my shading issues. I bought a few larger canvases to try when I am more confortable with this process and happy with the shading. If anyone has any tips, hints, or stories I would love to hear them. Have you tried the Pilot extra-fine pens (razor point) or the Staedtler permanent Lumocolor pens? This sounds like something I would love to do...thanks for all the tips!! Thanks for reading the post! I have not tried either of those pens for drawing. I like the Pilot for writing when I can find them. If you use either on the canvas you'll have to let me know how they work. I'd love to see what you create! I have done several tangles on canvas. The canvas already had a coat of gesso on it , so I didnt do anything to the surface before starting. To tell the truth, I couldnt wait!! I use permanent markers in different sizes. 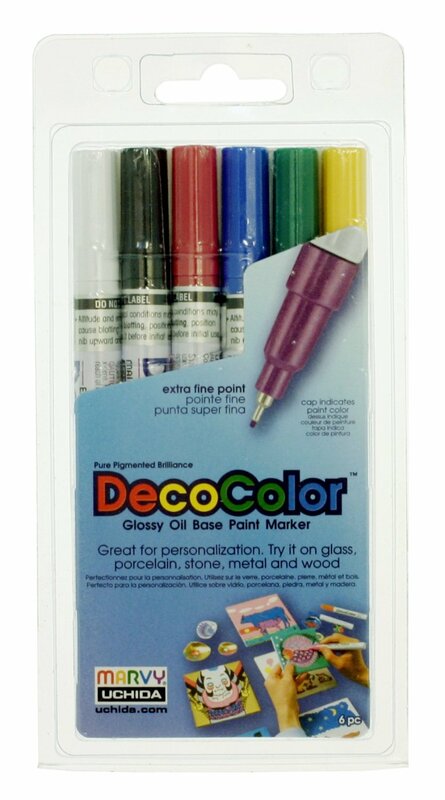 They start off fine but soon lose their points, so I move on to a new marker and keep the older one for filling in. Sometimes I get a nice smooth line but it isnt consistent, so thats what I shall work on. In fact my next one I might just put a coat of gesso on and sand it back to see if its any different. I really enjoy working on the large canvas, its freer for me. When the shading is done, they look quite good. I have tried lead pencil, black coloured pencil, charcoal pencil and conte pencils. I always blend afterwards. I found the lead best as I could erase it easily, and sometimes the other pencils became too dark when blended. With lead I could play with a kneadable eraser to get the tone I wanted. I think I used a 2B pencil. Dont know if thats any help, but we are all learning. You can check my blog to see what I have done if you like. I am finishing off 2 pieces today hopefully for our Art Teachers Art Exhibition which starts on this Friday, so its all stops out. Thanks for the tips. Your shading on they canvas that you have done is incredible! I have a few bigger canvas that I bought that I am ready to get started on. 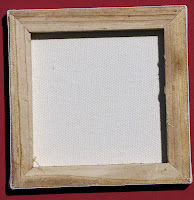 I am going to see about priming the canvas as well. This is such an exciting process I love it! If you prime your canvas first it will get rid of the texture in it, so it would make shading easier. 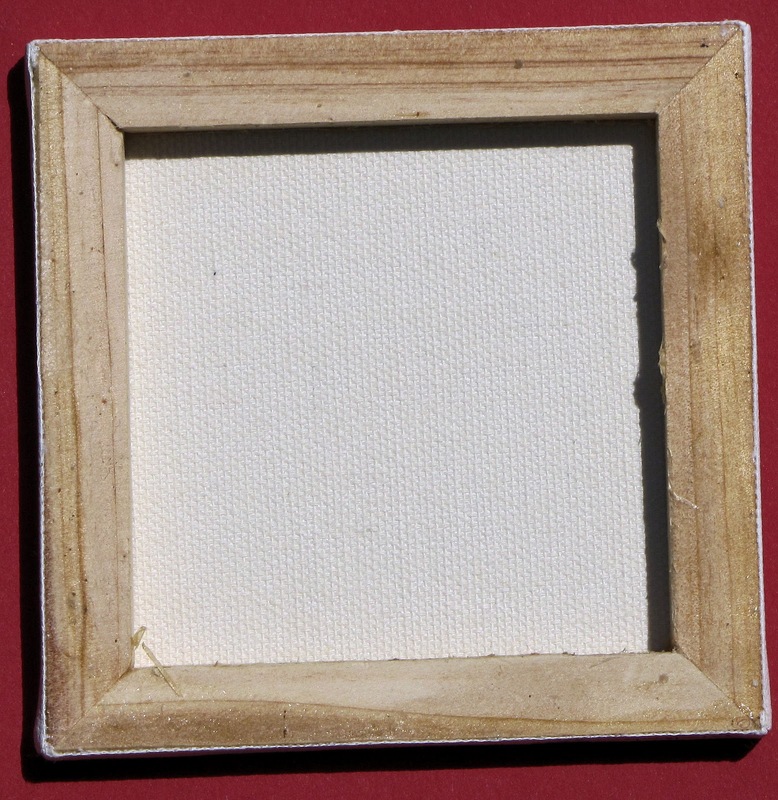 Did you use a tortillion or something to smudge the pencil in to the canvas? I did use a tortillion to smudge but I didn't press down as hard as I would on paper as I was afraid of stretching the canvas. The testure doesn't bother me so much but I may try priming one to see how different it is. Thanks! Oh Thank you so much! That is the nicest comment EVER. I am so glad you are here and following along. I will certainly follow you back!